Social Media Week comes to Beirut! Following on the great success of Social Media Week February 2011, the next iteration of Social Media Week will again span the globe this September 19-23, 2011, with simultaneous events in cities from all over the world. Confirmed locations include returning cities like Milan, Berlin, Buenos Aires, Bogota, and São Paulo, plus new entrants from Rio de Janeiro, Moscow and now happy to announce BEIRUT and I am thrilled to be part of the organizers. With each successive iteration, Social Media Week has grown exponentially, leading up to the February 2011 edition, which hosted simultaneous events in nine cities with over 600 events, 30,000 attendees worldwide, and generating more than 300M impressions online, made it the largest distributed conference in the world. Far more than just a conference, Social Media Week is one of the world’s most unique organized events, providing through a series of interconnected activities across the world a global and local perspective on emerging trends in social & mobile media across all major industries. 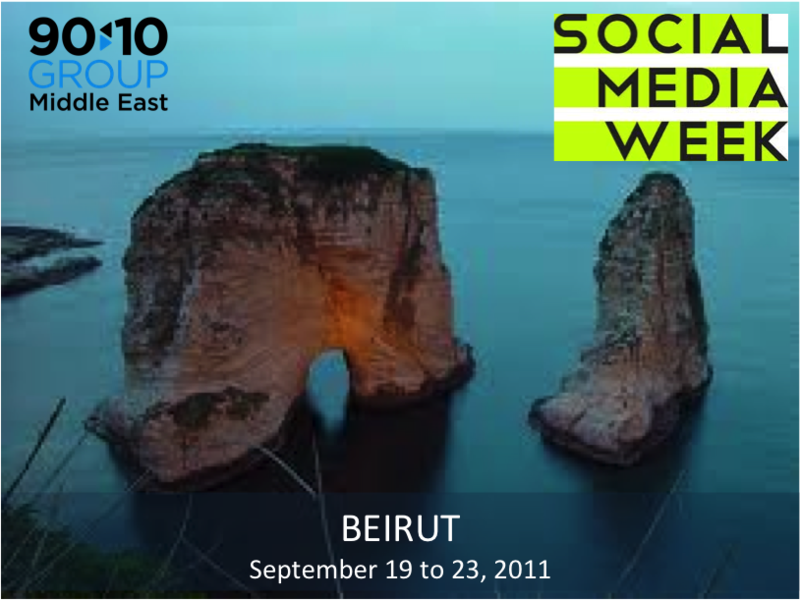 Social Media Week Beirut (SMW Beirut) will be organized for the first time in Beirut, brought to you and produced by 90:10 Group Middle East. SMW Beirut is aimed to be a unique and innovative social media week, happening over 5 days, with more than 30 events in different venues in the city, giving access to as large audience as possible, connecting people & content around diverse and rich themes, with speakers and participants from different horizons, bringing to all the learning experiences for a better understanding of social media in each of industry sectors. Your thoughts, advices, tips and all are more than welcome. This entry was posted in Digital and Social Media, Marketing, Media and tagged 90 10 group, beirut, event, internet, lebanon, social media, social media week, web. Bookmark the permalink.